If you’re just here for the IOCs, you will find a link to them at the bottom of the post. It all started with a routine glance at some log data. I noticed a significant uptick in suspicious DNS queries for the subdomain above; thousands were dropped by our security gear over the course of six hours or so. Unfortunately, I have been unable to determine the vector for these because we don’t have full PCAP abilities under normal circumstances. Nevertheless, I was interested in what this subdomain might have been serving up. What I found initially was not terribly surprising. What I found when I continued investigating, however, was a huge surprise. 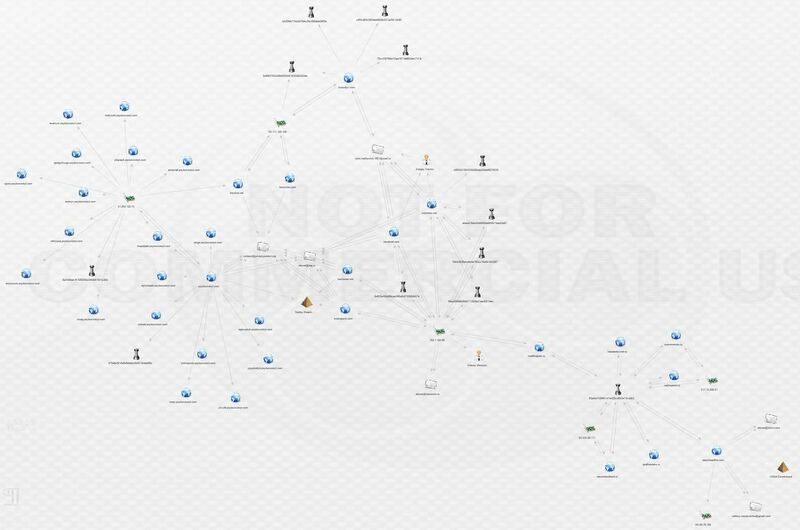 This post will demonstrate how free and open-source intelligence and analysis tools can reveal complex relationships and uncover shared malware infrastructure. I am not a professional analyst. I am a multi-discipline security engineer responsible for everything from firewall rules, to writing policy, to DFIR. Analysis is 5% or less of my job and is a hobby. Malware reversing is not a strength of mine. As such, I will not spend a lot of time with the malware discussed in this post. If you’d like to break it down and make a guest post, please contact me! Otherwise, please feel free to write it up yourself, I’d love to know more. All of the tools used to conduct this analysis are either open-source or free accounts for various services. I have omitted some data in the analysis, such as phone numbers. The free versions of Maltego and PassiveTotal have significant limitations which mean that the analysis is not fully “fleshed-out.” I will continue to work on this case going forward. My first step was to enter the subdomain into threat_note, a handy research and indicator tracking notebook from @brian_warehime. 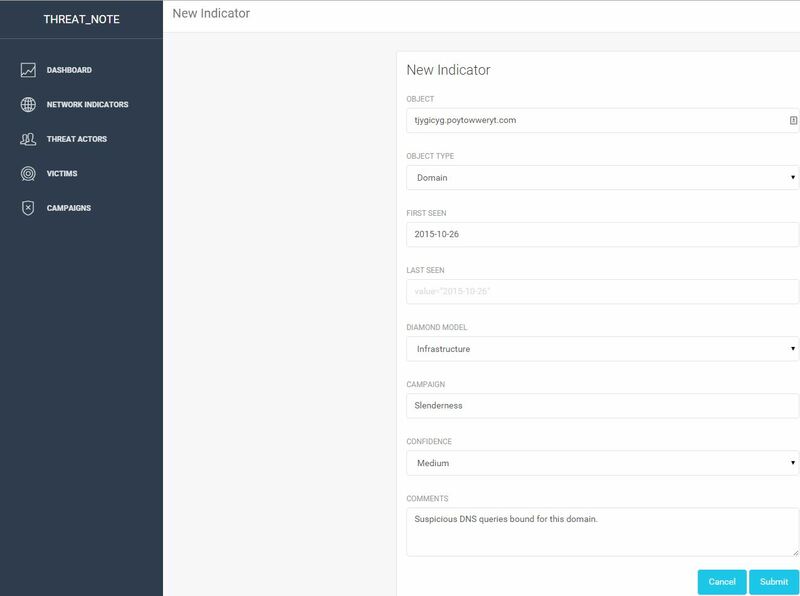 Threat_note will pull back whois data, passive DNS where possible, and a nice ThreatCrowd visualization with a quick link to pivot into ThreatCrowd. Still not much new here, but as with the original subdomain, there is some unusual data present. A Russian registrar located in Nobby Beach, Queensland, Australia? Certainly bizarre, my interest is now piqued. 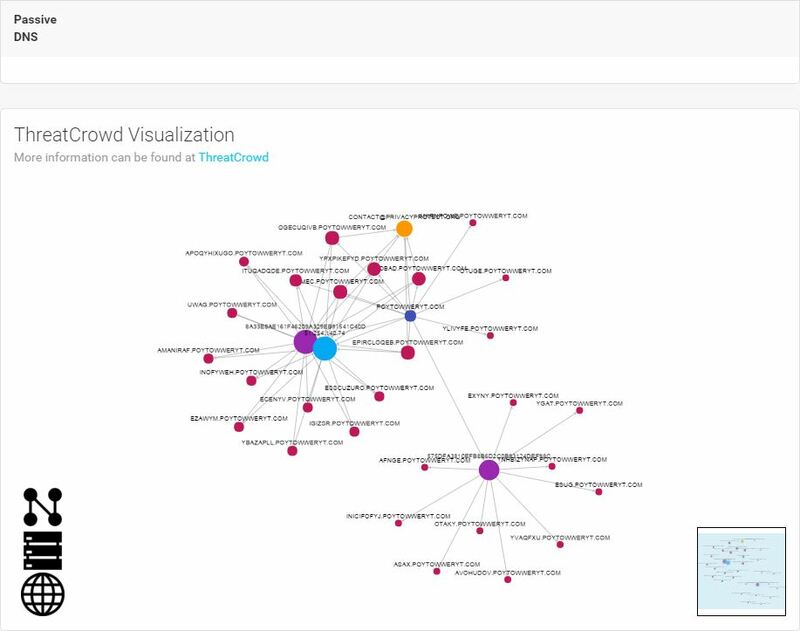 Let’s scroll down a little further and take a look at the ThreatCrowd visualization. Now we’re cooking! 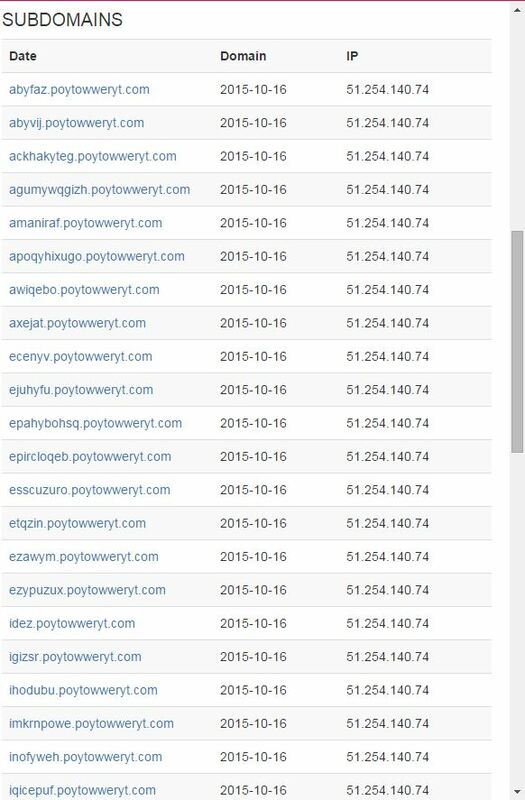 There are malware hashes, a nice network of subdomains, and an IP all associated with poytowweryt.com. 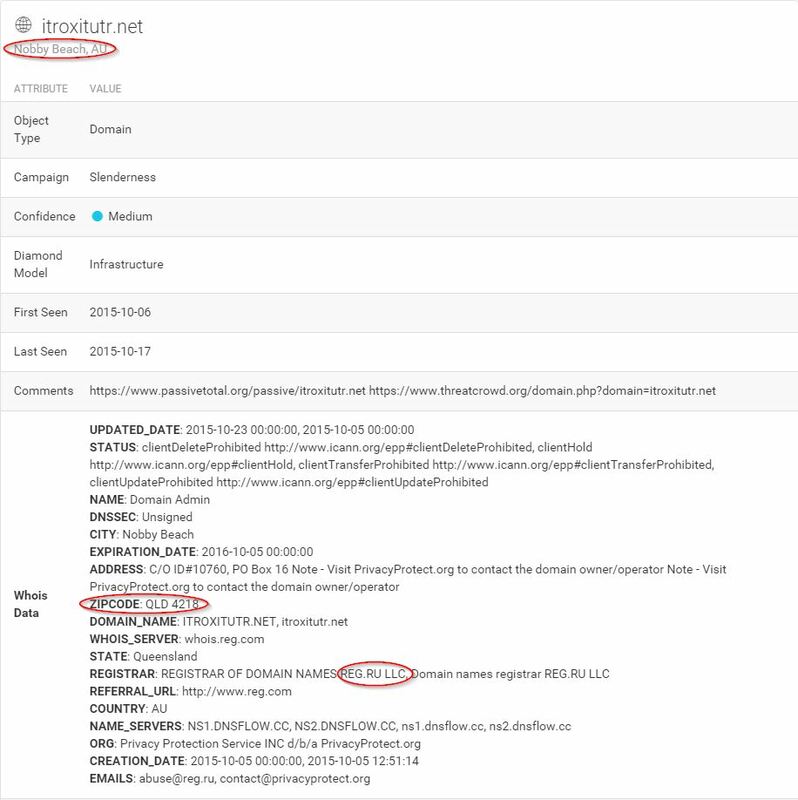 In order to understand what we’re looking at, understand that ThreatCrowd pulls data from a variety of public intel and analysis sources such as VirusTotal, malwr, and Payload Security and correlates it with its own history of DNS and whois data. 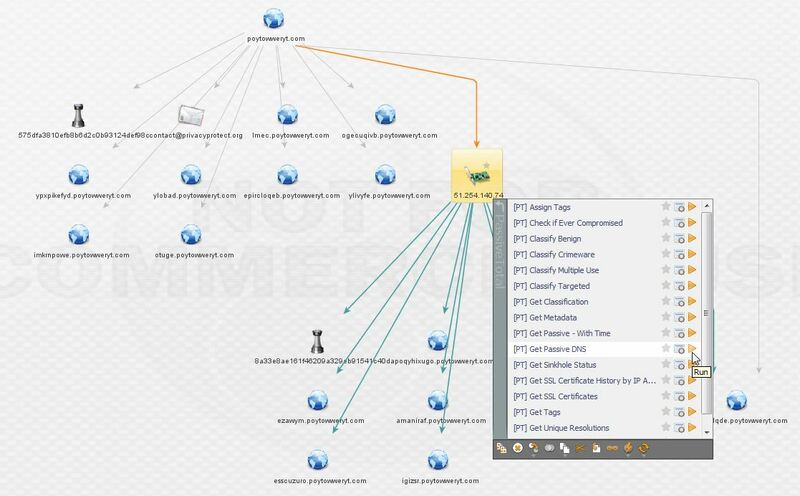 Data ingested includes domains/subdomains, IPs, malware hashes, and whois information. 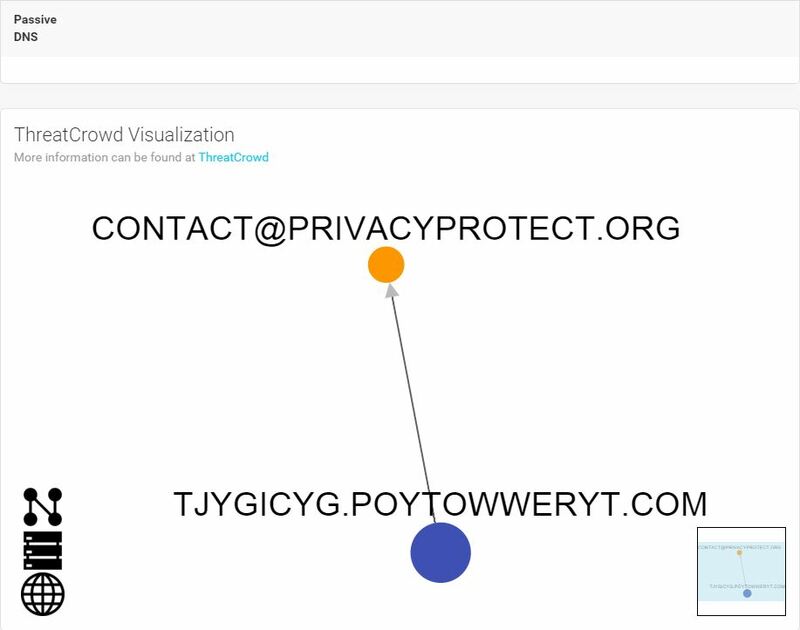 Let’s hop into ThreatCrowd via the handy pivot link provided. A substantial network of subdomains is present, all linked back to a single IP. How about the malware? Definitely has some unwanted behavior associated. And what is Slenderness? Whatever it is, I stole it as a campaign name for threat_note. Let’s look at VirusTotal, what is this thing? 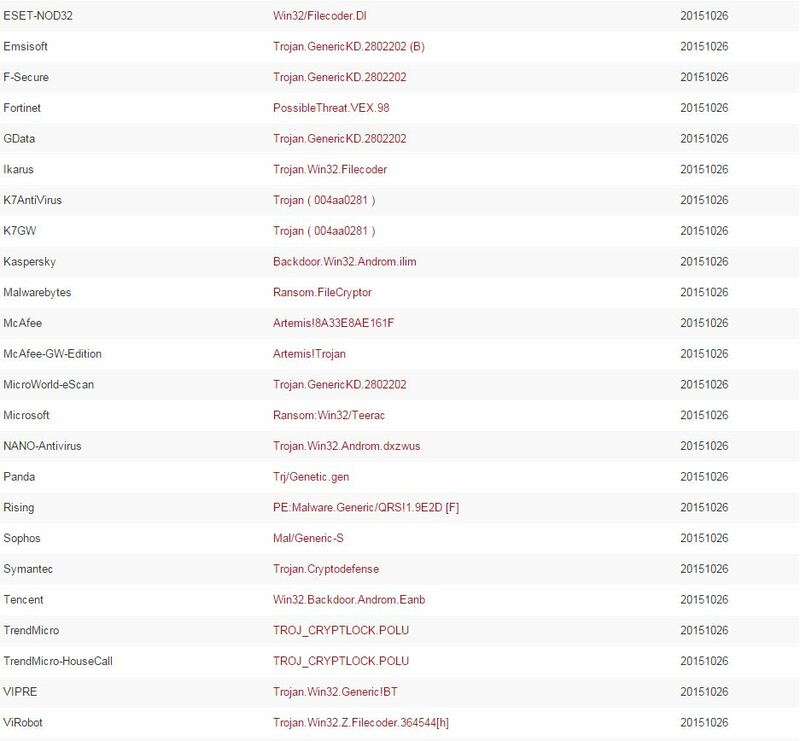 Looks like a fairly standard Crypto-variant ransomware, though some vendors appear to be classifying at a Zeus variant or the Androm Backdoor. A google search of the IP hosting it, 51.254.140.74 brings us to abuse.ch’s SSL Blacklist. Ah, it’s TorrentLocker; that will surely ruin someone’s day! So what do we have so far? Looks like a small distribution network for ransomware. That’s a pretty common thing these days, likely a dime a dozen if you’re really looking. Let’s hop over to Maltego and explore a little more using ThreatCrowd and PassiveTotal transforms. 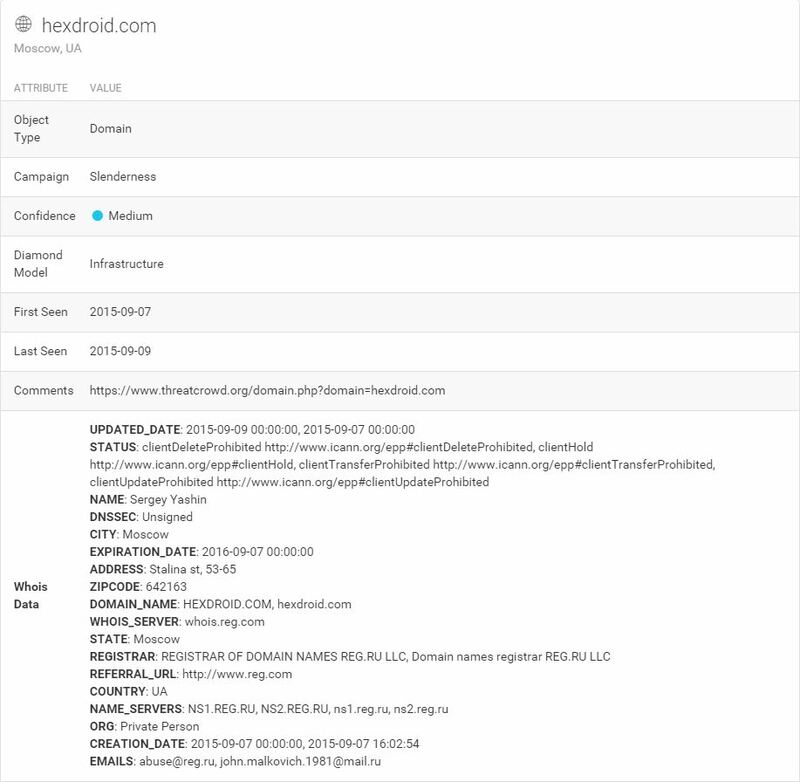 This is the first domain expanded via the ThreatCrowd transform. As noted above, I do not have access to the full version of Maltego, so all the subdomains are not present. 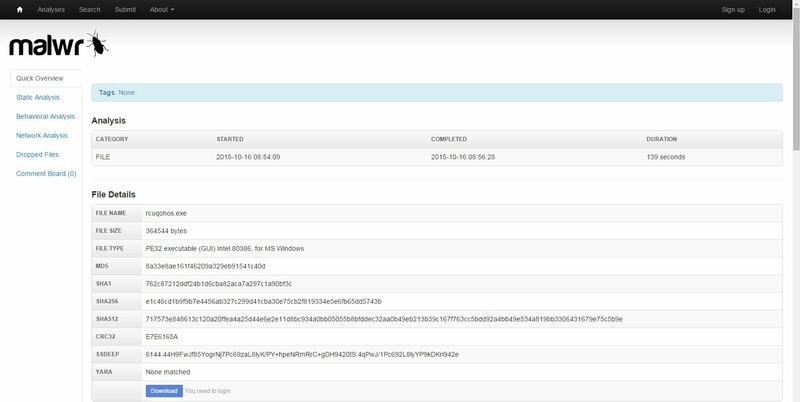 The next step is to enrich the IP using the ThreatCrowd transforms. 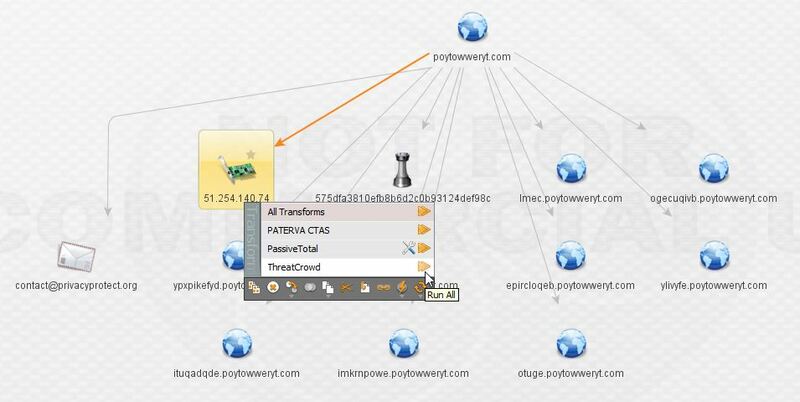 These transforms basically extend all the search and correlation power of ThreatCrowd right into Maltego. 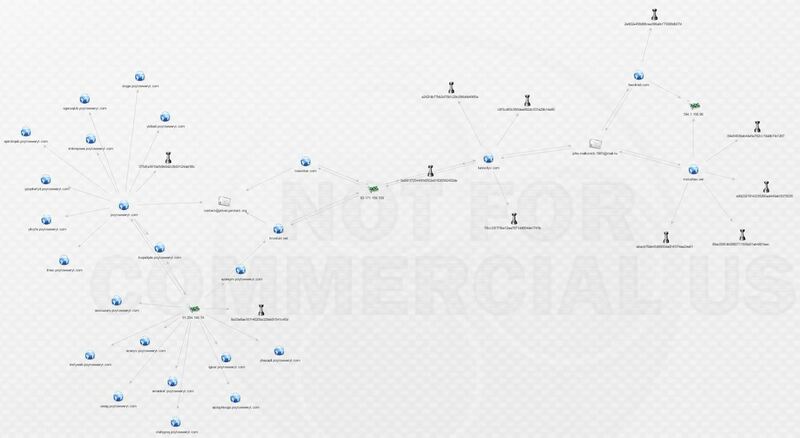 Here we can see the IP hosts the second piece of malware from the main domain as well as a bunch of the subdomains that represent it. At this point, I want to be sure I’ve got the full history of the IP, so I elect to transform via PassiveTotal and pull back their entire passive DNS history (sadly I cannot do this for all of the IPs during the investigation due to limitations of the free account). 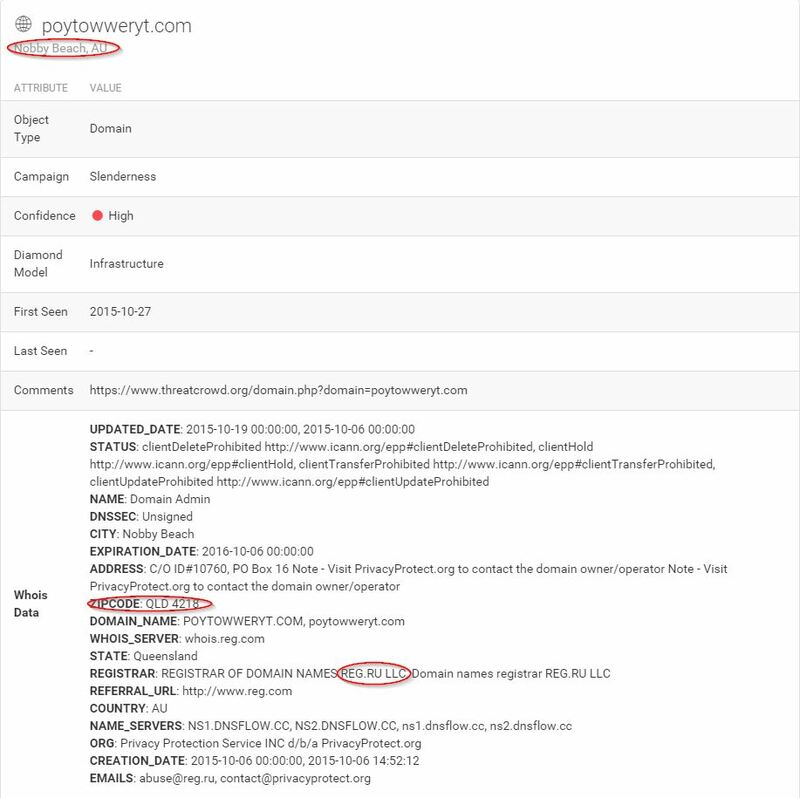 The result is a new domain not picked up by ThreatCrowd, highlighted below! The PassiveTotal results are available below as well. Now we’ve got a new lead. 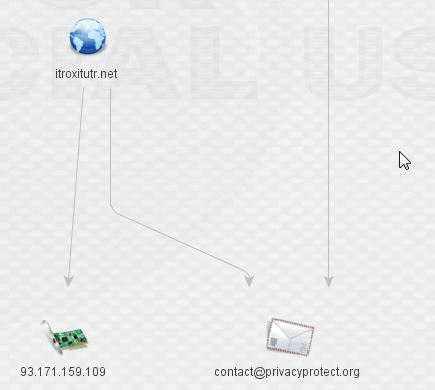 Enriching itroxitutr.net gives us a new IP and we can see it’s hidden behind the same suspicious registrar as before, based on the contact e-mail present. 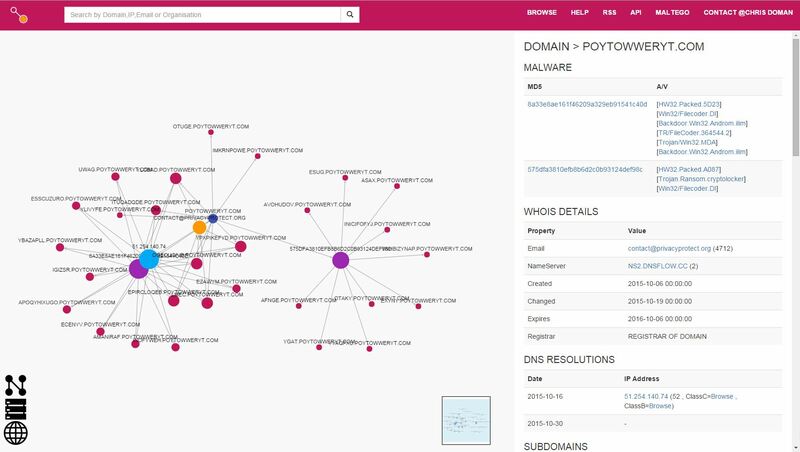 Expanding the discovered IP leads us to new malware and two new domains. At this stage, I went back to threat_note for some whois data (it can be produced in Maltego too). 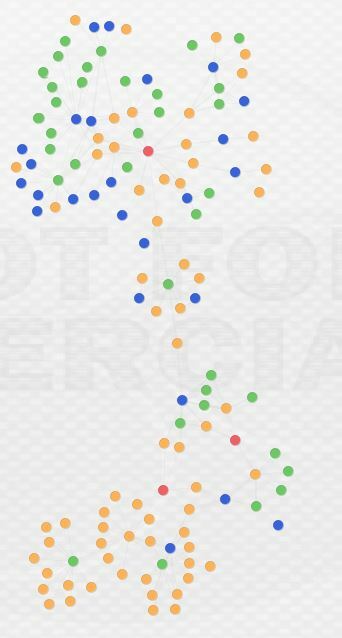 Recognize what’s circled? It’s that same shady domain registrar. 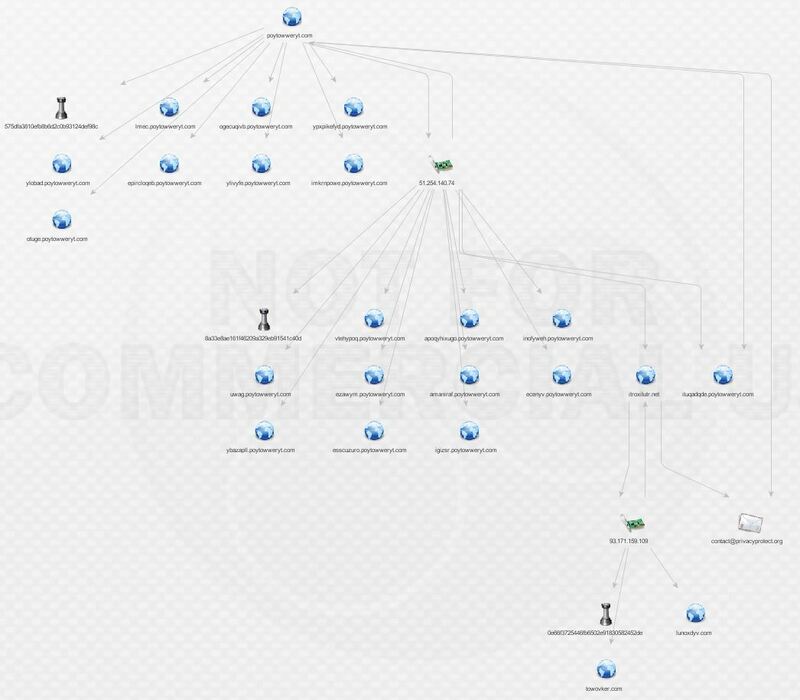 Aside from the direct DNS associations, there’s a very obvious theme present in that all of the domains are registered behind an unusual private registrar. 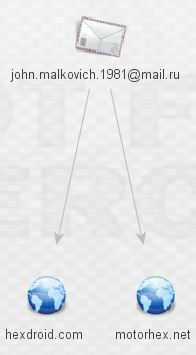 The IP itself, however, gives our second clue in terms of Geolocation (the first being the TLD of the registrar). It’s hosted in Ukraine. That won’t shock anyone in our line of work, but it certainly raises the probability of nefarious intent given the other indications present here. See below. 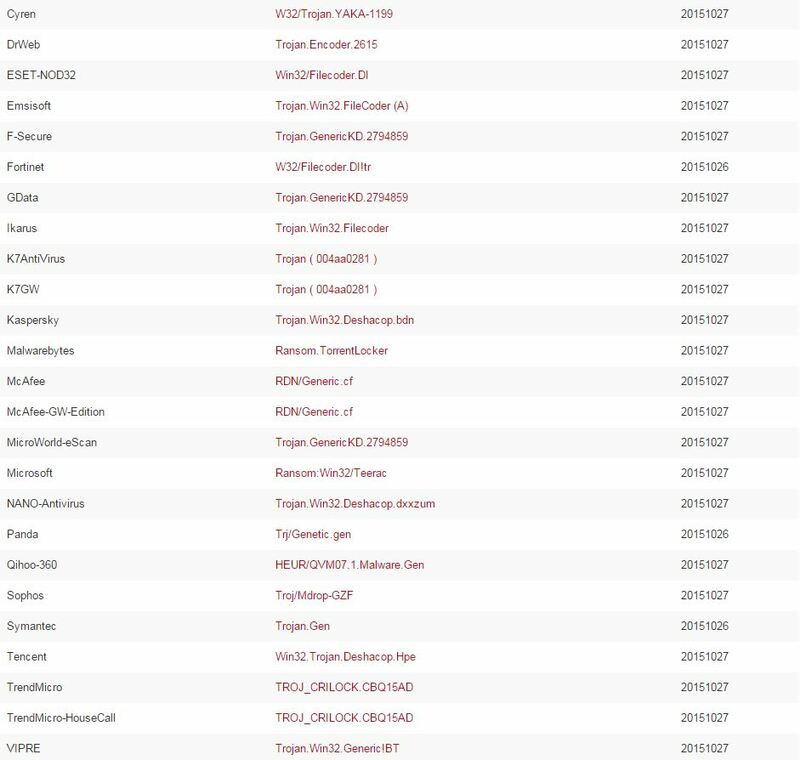 What can we learn about the malware related to itroxtutr.net? Looks like more crypto-variant ransomware, very similar to what was hosted by the original domain, quite likely TorrentLocker again. At this stage, we’ve discovered two separate IPs fronted by a good number of domains and subdomains all serving ransomware. Still nothing out of the ordinary present here, but this is a great exercise nonetheless. Before expanding things any further, here’s a look at an overview of what we have discovered so far. It’s reaching a point that it is difficult to take readable screenshots, especially if I use the hierarchical views. It would appear that these may be two slightly different malware networks sharing a common piece of infrastructure: 93.171.159.109. Unsurprisingly, that IP is on the SSL Blacklist for being a TorrentLocker C&C host. 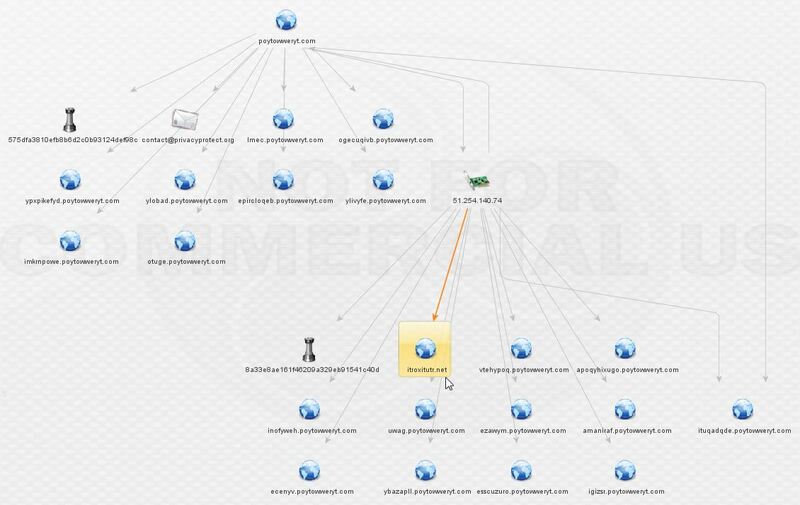 There’s a nice write-up on TorrentLocker from @marc_etienne_ at ESET here. We want to continue following the breadcrumbs, so let’s go back to Mr. Malkovich. What can we find out by pivoting off his address via ThreatCrowd? We’re not in Kansas anymore, Toto! That makes two new domains. 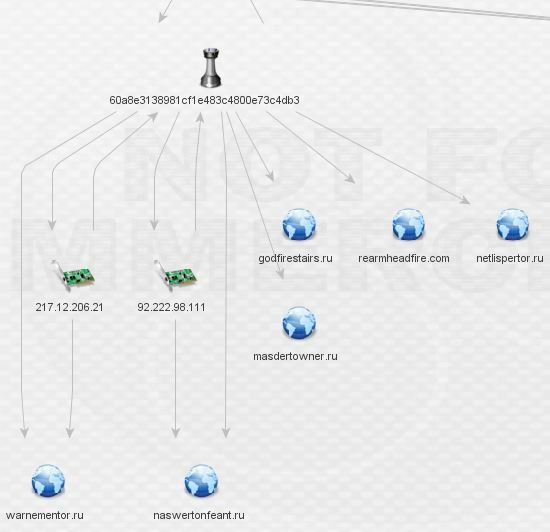 Expanding those domains reveals yet more malware and a shared host, 191.1.156.96. 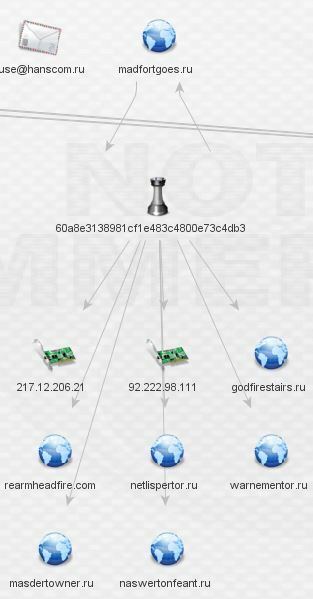 What kind of malware is Mr. Malkovich serving up at motohex.net and hexdroid.net? More ransomware? Looks like it. A name to go with that e-mail! Sergey Yashin, perhaps a play on a retired ice hockey player. 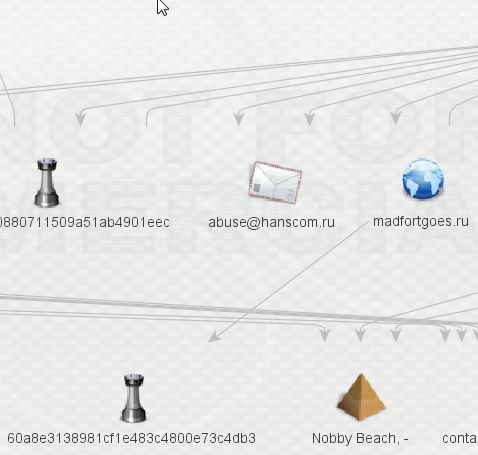 Though a likely alias, let’s pull the whois in Maltego and draw a link between Sergey and his e-mail. I’ll revisit Sergey in another post. So, now we have three more domains and a new actor, Alexey Morozov (I omitted the listed phone number). In addition, the IP is not owned by Sergey Yashin as I had expected. How strange! Alexey is a malware author, as seen here on the file detail tab. It’s also possible he’s really an attempt at registering as another hockey player. Sad to see retired hockey players need to supplement their income in this manner (obviously, again, these are likely aliases). At this point, we’re still in a network that appears to be dedicated to the distribution of ransomware, primarily, if not entirely TorrentLocker. That’s about to change. 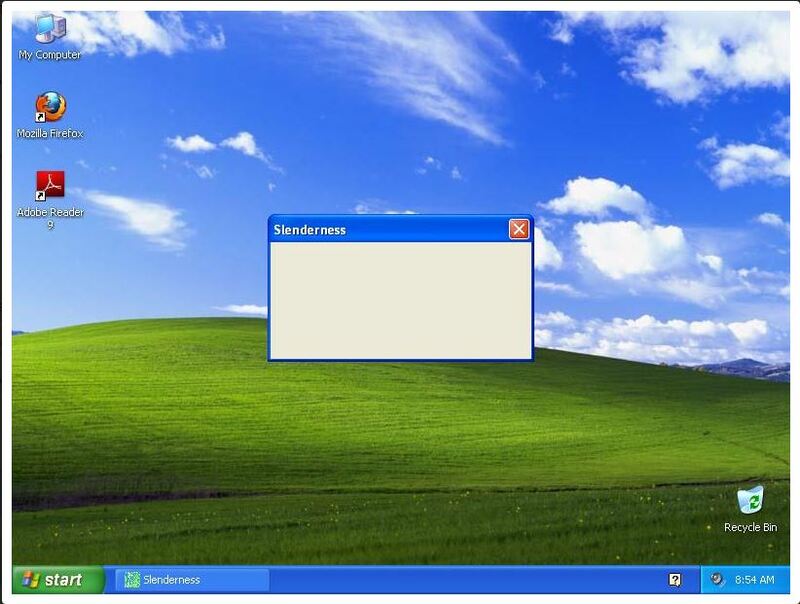 Let’s expand madfortgoes.ru. Just one link, to a piece of malware, and no useful whois information. Is this a dead end? Investigating the malware brings about something substantially more nefarious than TorrentLocker. Well, hello! 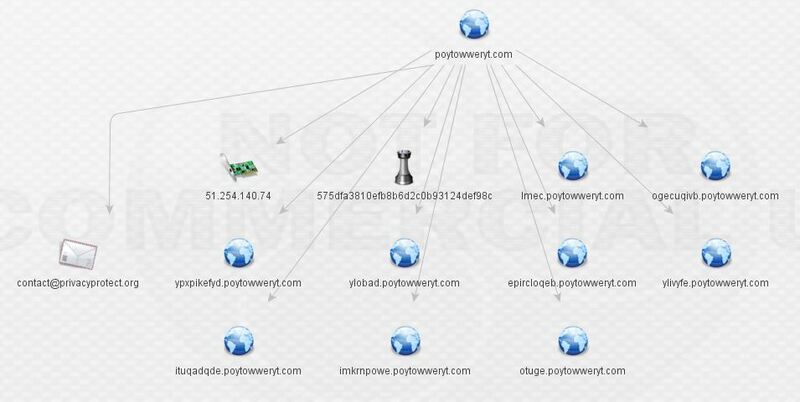 Looks like a clear link indeed from our rinky-dink TorrentLocker network to the Pony botnet! 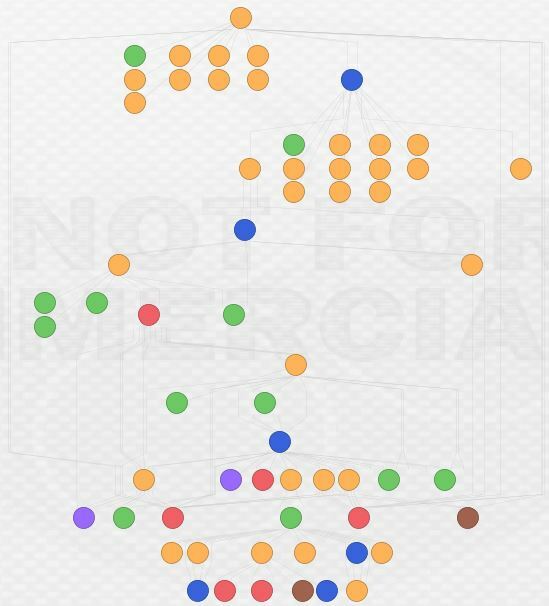 What conclusions can we draw from this analysis? First and perhaps foremost, open source and free tools can be tremendously powerful. Beyond my own hardware, I didn’t pay a dime for any of this data or the tools to analyze it. 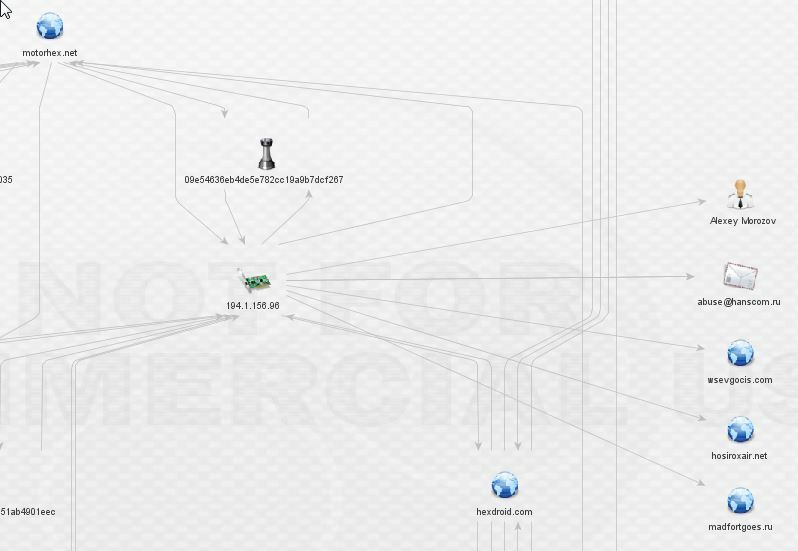 The result is pretty interesting; I managed to uncover, in the span of an evening, a link from an operating TorrentLocker distribution network to the Pony botnet. Second, this analysis reveals that malware infrastructure sharing and reuse is likely prevalent among Eastern European cybercriminal groups. 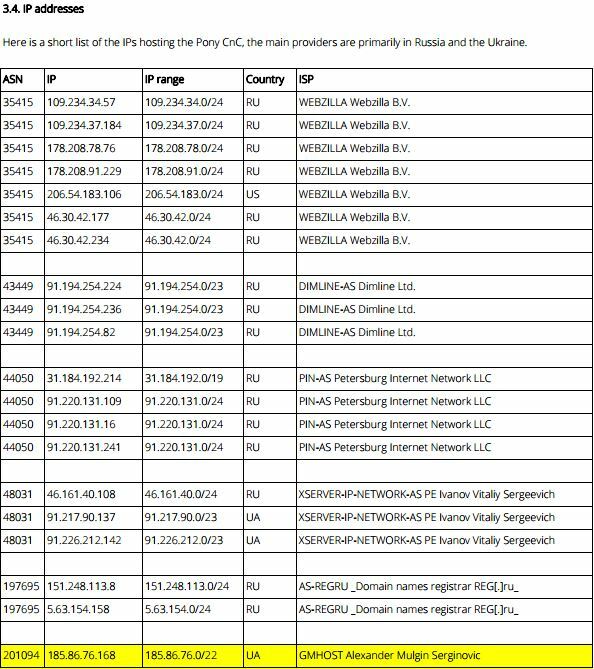 As I continue to analyze this case, I’m curious to see if there will be links to additional malware distribution networks. I spoke with Brian Warehime about this and he mentioned something really interesting: changing infrastructure and TTPs is expensive. The bad guys probably have their own version of the Pyramid of Pain in which it is more costly and resource consumptive to change certain parts of their operation. 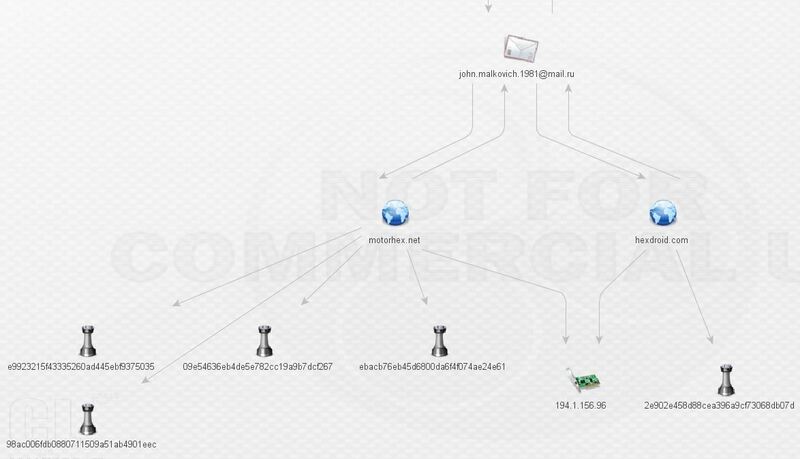 Finally, and perhaps unsurprisingly, these cybercriminals are making heavy use of private registrars and false whois data to shield both themselves and their infrastructure. I welcome any comments or additional analysis! Find me over at @swannysec. The IOCs generated by this investigation are hosted on github. For now, a Maltego Entity file is all that’s available. As soon as I can get my hands on a full version of Maltego I will add CSVs (CSV export is disabled in the free version). IOCs will be updated as I progress through additional analysis. Brian Warehime for inspiration and threat_note. 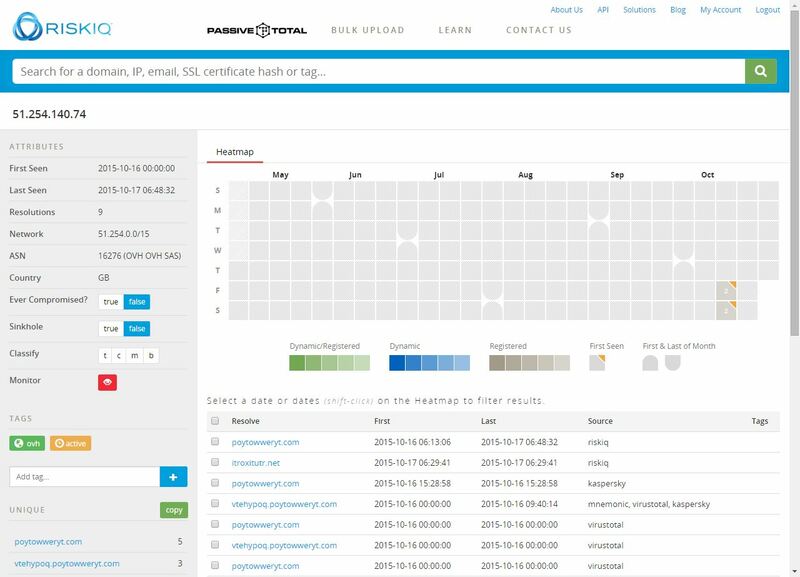 PassiveTotal, malwr, Virustotal, and Paterva Maltego.